ZAATARI, Jordan For many Syrian children traumatized and driven from their homes by their country's civil war, the opportunity to head back to school -- even if it's in a dusty, wind-swept refugee camp -- is a chance to return to a semblance of normalcy. The children have a lot to try to overcome. Many have had relatives killed. They have seen their neighborhoods destroyed by bombings as the regime of President Bashar Assad battles rebels who have been trying for 19 months to topple him. They have endured as they and their families fled across the border into an unknown future in Jordan. "Bashar shelled us and my cousin died. I want Assad to go away, so I can go back to Syria," said Safa, a 13-year-old who was among 2,300 children who were able to resume their studies in this tent city near Jordan's border with Syria. "They started this school to try to help us forget what has been happening, but that's hard. Still, I'm happier now that I can study again," said the petite girl in a black headscarf at the beginning of her Arabic grammar class. The start of school in the Zaatari refugee camp is a step in international efforts to help Jordan deal with what has become an overwhelming wave of refugees from the Syria conflict. More than 200,000 Syrians who fled the civil war are now in Jordan, their numbers growing daily, according to the U.N. refugee agency. Zaatari is home to 33,000 of the refugees, and it has become known as the "children's camp" because nearly half its residents are under the age of 18. The U.N. children's agency hopes classes and the routine they provide will bring some stability back to the children's lives. "School is the first step to bring children to a place of healing," said Dominique Hyde of UNICEF, which along with Jordan's Ministry of Education, opened the school at the camp last week. "It's where we will be able to notice some of the psycho-social consequences of all of the challenges that they've lived through. Many crossed the border with almost nothing on their backs. Families are distraught; the parents do not know what the future holds," she said. At a girls class, 13-year-old Rasha, from the central city of Homs, said she suffers from constant nightmares. "I keep seeing my uncles shot and bleeding from everywhere," the young girl said, as her face turned ashen. "My mother tells me a story to try to help me sleep, but it's not working." Another girl, Raghad, said her house was destroyed in Daraa, the southern Syrian town where the uprising began in March 2011. "It's much better here than in Syria. At least I can study again in school. But it's hard for me to sleep at night because I often feel pain," the 11-year-old said, as she wiped a tear from her eye. So far, the school consists of 14 large green and yellow-striped cloth tents, each hosting two classrooms of 40 pupils each, covering grades 1-12. Inside are plastic chairs and tables, blackboards, pencils and paper. Girls attend classes in the morning, boys in the afternoon because there is not enough room. Currently, 2,300 children are enrolled, just over half those who have registered to enter classes. But the camp's population -- and the number of children -- constantly swells. An average 200 Syrians arrive daily, and that number can surge at any time as violence spikes inside Syria. During only two days in August, 5,000 flowed in. A school for 5,000 students, funded by the Bahraini government, is due to be completed by the end of the month, said Hyde, UNICEF's representative to Jordan, and the organization has appealed for funds to take in more. The help is also needed outside the camp, with more than 160,000 refugees living in various Jordanian communities. About 18,000 of their children began classes last month in Jordanian government-run schools, which are getting international aid to absorb the influx. At least 200,000 Syrian children displaced inside their country are having difficulty accessing education, Hyde said. Tens of thousands more Syrians have fled to Turkey, Iraq and Lebanon. The refugee issue has raised worries that Jordan could be dragged into Syria's conflict. On Wednesday, the U.S. said it had stationed more than 100 military personnel in Jordan to help in the crisis, including helping it absorb the refugees. The team -- which is the closest American military presence to Syria's civil war -- has been providing medical kits, water tanks and other humanitarian supplies to Jordan, as well as training to its border troops on dealing with refugees. The school is part of a drive to improve conditions at Zaatari, where rioting has broken out several times as refugees complain of lack of lighting and water and the stifling dust at the camp set on a parched, treeless strip of land. "We're in a race against time to get things done before winter," said Andrew Harper of the U.N. agency for refugees. Communal kitchens are being built, refugees' tents and two school tents will be winterized with heaters and insulation, and a drainage system is being installed to deal with winter rains. 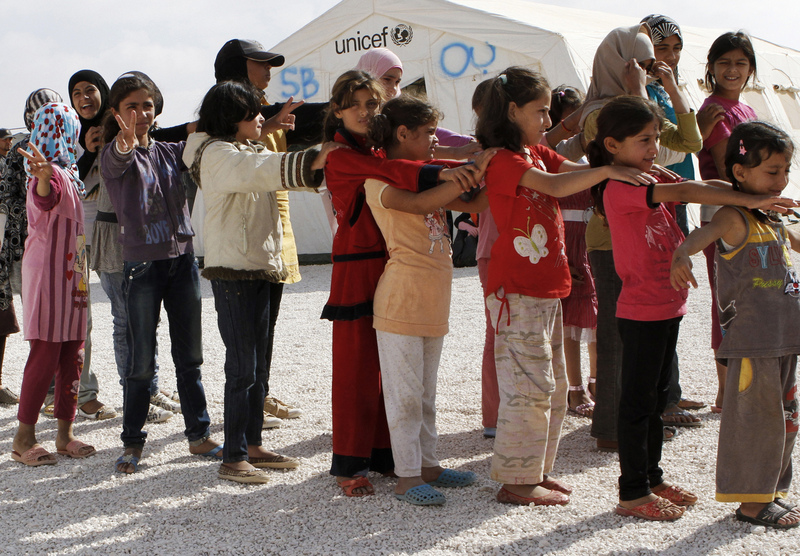 In Zaatari, UNICEF is working with British-based Save the Children and the International Medical Corps to provide counseling for the camp's traumatized children. For Ahlam, a 10-year-old from the central Syrian town of Homs, school is a welcome respite from the death and destruction, but she just wishes the nightmare back home would end. "They attacked us and they started to kill us. That is why we ran away," said the tiny girl, with honey-colored curls. "Sometimes, I have nightmares of people attacking me. I hope everything in Syria would just go away." Outside the school's gate, seventh-grader Saud from Daraa could barely wait for his and the other boys' shift to start. He said his family fled to Jordan because his brother was wanted by the security forces. "Usually the regime takes those on its wanted list and slaughters them in front of their family," he said. "That's why we escaped here."